Aaron Street is the co-founder and CEO of Lawyerist.com. In addition to his work growing Lawyerist’s community of small firm lawyers, Aaron is active in many facets of the legal industry, serving on the Board of the ABA Legal Technology Resource Center (LRTC), the State Assembly of the Minnesota State Bar Association, and the Board of the Hennepin County Bar Association. Aaron’s prior work includes a weird array of activities at the intersection of law, business, and public policy, including work as an election law attorney, a CLE programmer, and a baseball card dealer, and leadership roles at a think tank, an innovation management company, and a robotics business. Patrick Palace talks about how lawyers can help make legal services affordable to all consumers. Stephanie Everett, Community Director at Lawyerist, talks about the big picture of what Lawyerist is up to and what the one-year road map looks like for Lab members. From documentation processes to mailing resources, Lori Gonzalez shares how to improve your law firm with the simplest of legal technology tools. Ryan Holiday talks about the big takeaways for lawyers from the Gawker-Hulk Hogan lawsuit and how lawyers can learn resilience from modern stoicism. This week Jennifer Gerstenzang joins us to talk about her innovative legal coaching and family advocacy services, which help defendants and their families effectively navigate criminal defense charges. In this episode with Joey Coleman, we talk about what client experience really is and why it’s important—especially during the first 100 days. In this episode with Conor Malloy, we talk about some of the technologies Conor has built into his firm, and how those tools have changed the structure of his law practice. Paul Spiegelman talks about how developing an internal law firm culture is a recipe for success. Mitch Jackson discusses augmented reality with Sam, including what it is and how it can be useful in the courtroom. Goals, successes, and design of the British Columbia’s Online Civil Resolution Tribunal. Using technology and the design process to approach systemic problems in the legal industry and what to do for justice to be accessible for everyone. Peter Aprile and Natalie Worsfold talk with Sam about the way they think differently about building Counter Tax Lawyers, a law firm that develops innovative strategies for resolving tax disputes. In this episode we're joined by Alan Sugarman to talk about the landmark case that opened up access to law and ultimately resulted in more options for online legal research today. Sam Glover talks with Dean Cardinale, a professional "adventurer," about achieving big goals, and how you can apply the same knowledge to leverage your business aspirations. Attorney branding specialist Nicole Abboud talks about the benefits of tailoring your firm to meet the demands of a growing millennial clientele. Deaf-blind civil rights lawyer and accessibility advocate Haben Girma talks about accessible justice and how designing courts, law firms, and the attorney-client relationship for people with disabilities can increase access to justice for everyone. Laura Genoves talks about being one of the first Limited Licensed Legal Technicians in Washington State and the differences between a legal technician and a practicing attorney, including everything from education costs to how each can practice. How may stress be sabotaging your clients and getting in the way of your ability to represent them? How did unbundled services come to law practice and what's the future of unbundling and its potential for closing the access-to-justice gap. Christina Scalera explains why Pinterest really is a great place for lawyers to build business, and how to approach it. Can lawyers offer "primary care" law, the concept of addressing small and general issues to clients who may not need a specialist. Joyce Tischler discusses lessons learned from the founding of Animal Legal Defense Fund, which she founded in 1979. How should lawyers begin thinking about a career change and what's right for you as an individual? Doug Brackmann explains why traditional meditation may not work for innovators, entrepreneurs, and other highly driven individuals. 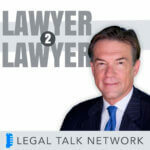 Legal Malpractice Insurance in One Hour for Lawyers author JoAnn Hathaway explains why you need malpractice insurance and how to shop for it. Alix Devendra explains why lawyers need to learn and apply design thinking in their law practices. In-house lawyer Elliot Miller and outside litigation counsel Adam Losey discuss the different perspectives they have in their respective roles, the realities of traditional v. alternative billing structures, and the importance of trust. Gyi Tsakalakis explains why local search marketing matters online and how to do it effectively. Tim Stanley talks about public access to law and why it's taking so long for courts to get on board. In this episode, we talk to Joshua Browder about how he built his DoNotPay chatbot—which has already helped thousands an is about to grow into 300+ robot lawyers—has made robot lawyers a reality. Sam Glover talks to Carl Malamud about public access to law and how it is threatened. They discuss how lawyers benefit from public access to law and how they can help increase it. Why has law has become a "buyers market" and how can lawyers take advantage of the opportunities presented by that market by becoming client-centered law practices? Minnesota lawyer Marshall Lichty explains why mentoring is important, how lawyers can find a mentor, and how experienced lawyers can find a mentee. Wendy Calvert discusses what it means to have a "crossover" practice as a corporate consultant, real estate lawyer, and realtor. Former public defender Brad Clark explains how he started his own firm, powered by a criminal expungement web app that lets him start helping people before they even contact him. In this episode Sam Glover talks to Nika Kabiri about how your clients' stress makes it hard for them to make good decisions, and how you can help them work around it. 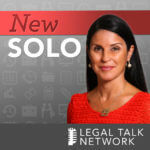 In this episode we talk to Erin Gerstenzang about her solo criminal defense practice and the challenges of going solo, especially for newer lawyers. Josie Beets explains why military spouses who are lawyers should be able to get a license to practice law without taking the bar exam over and over again. Ansel Halliburton talks about how technologists have come together in solidarity against data collection and surveillance and how paranoid you should be. Chad Burton, explains how (and why) he ditched his computer for an iPad Pro, and then ditched his iPad Pro for his iPhone. What are the challenges of integrating several law practices into one functioning business? Mindy Yocum, founder of a socially conscious law firm, explains how she envisions her role as a lawyer. The world of weed law, the ethics of advising clients who are committing federal crimes, and how to market a niche practice. Should lawyers learn to develop their own software and can they forecast the future of law practice? Dr. Heather Hackman helps us get a new perspective on diversity and the legal profession. Bryan Wilson, the Texas Law Hawk, explains how he got started making outrageous viral videos and has some tips for lawyers who want to make videos of their own. Drew Amoroso talks about starting a small fitness law firm, why he chose a niche, and working out with clients before business. Former public defender Brad Clark explains how he started his own firm, powered by a web app that lets him start helping people before they contact him. Lisa Solomon explains what freelance lawyering is, how to work with a freelance lawyer, and where to find one. 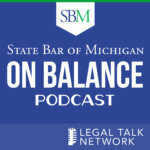 In this Lawyerist Podcast, a discussion on the benefits and downfalls of shared working spaces for lawyers. Sam Glover talks with several attendees of the inaugural edition of TBD Law, a first-of-its-kind gathering of innovation-minded lawyers. Sam Glover talks with Jamie Sutton, a third-year law student who has already started his own sliding-scale nonprofit law firm. Computer forensics expert Mark Lanterman talks about the dark web and the latest trends in law firm security breaches. Nicolle Schippers talks about what legal insurance is and how it can help to bridge the access to justice gap. Solo practitioner Randall Ryder talks about what it is like to go out on your own when you have no safety net. Janine Sickmeyer, CEO and founder of NextChapter, talks about how she went from being frustrated with her practice management software to building her own.